Lamborghini set sales record despite decline in U.S.
DETROIT -- Lamborghini sales in the United States fell in 2008, but the brand still had a record year worldwide, said president Stephan Winkelmann. We balanced sales in the Middle East, China and Southeast Asia with the drop in the United States, he said. Lamborghini sold 741 cars in the United States in 2008, down 20.3 percent compared with 2007. Worldwide, it sold 2,430 cars in 2008, compared with 2,406 in 2007. The United States is Lamborghinis largest market, followed by Italy. The ability of Lamborghinis customers to buy its cars, which start at $200,000 , has been reduced by the economic downturn, said Winkelmann. Lamborghini will stick to its strategy of coming out with at least one new product a year, he said. 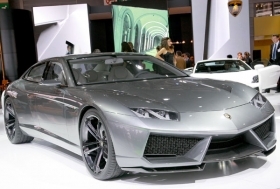 Lamborghini plans no marketing cuts in 2009, he said. Lamborghini will continue below the line advertising such as taking a potential customer to the racetrack to watch Lamborghini cars perform. It does no above the line advertising, such as print or TV ads, said Winkelmann.